What makes a movie feel like a video game? I’m barely a gamer at all, especially in the most contemporary sense, but even I can be suddenly seized by the vague impression that what I am watching bears the aesthetic and narrative sensibility of a third-person shooter. In Overlord, a World War II B-movie horror show directed by Julius Avery (and perhaps more importantly, produced by one J.J. Abrams), that sense of automated reality is blurred even further by a kind of poreless throwback war-movie filter, where even practical props and sets — a spooky lab here, a glowing syringe there — felt somehow rendered. Again, I’m not a gamer, but I spent most of Overlord kind of wishing I was playing BioShock instead. Or maybe one of any kill-the-Nazis titles out there — the visceral satisfaction probably would have been greater. Screenwriter Billy Ray has accomplished the strange trick of making a kill-the-Nazis story that is somehow entirely apolitical. 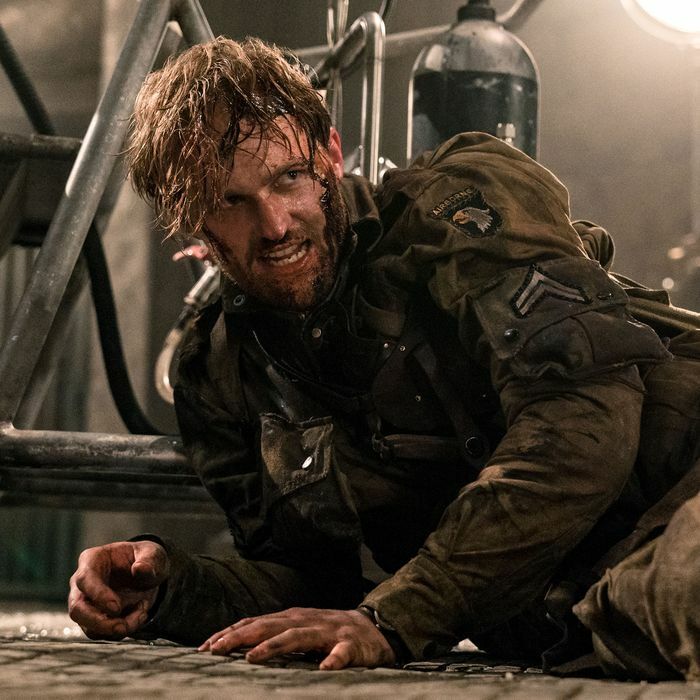 Overlord takes place in Nazi-occupied France, and supposes a kind of chapter of secret history in which American troops disable a radio tower pivotal to the Normandy Beach invasion by … blowing up a Nazi lab that is developing a race of superzombies. Surely Ray is aware of the fact that actual human experimentation was being done by the Germans during this time, but the film is neither fancifying that historical truth, nor outdoing it for horror. Other than a brief aside by a tertiary Jewish character early in the film, there’s no acknowledgement of anything the Nazis were doing during this time other than intimidating poor French villagers. This is a B-movie, yes, and I hardly expect Ken Burns–level solemnity or rigor, but Overlord’s problem is that it doesn’t seem terribly interested in showing us who its villains are, and thus significantly mutes the satisfaction of watching them get flamethrowered to death. It’s a little dismaying because it’s clear that Avery has the tools to knock this out of the park, at least on a technical level. The film’s opening sequence, in which we meet our band of allied soldiers before they parachute over the target of their mission, draws its ensemble of stock characters quickly and hackily, including our reluctant hero Boyce (Jovan Adepo) and the seen-it-all Corporal Ford (Wyatt Russell, channeling his father more overtly than usual). The plane is hit by enemy fire, and Boyce is thrown out of the plane into the dogfight, free-falling through bullets and flaming aircraft. We go right along with him, screaming and panting and tumbling through the chaos, and the effect is both thrilling and unapologetically synthetic. Luckily, Boyce manages to deploy his parachute with particularly fortunate timing, and he and the rest of the surviving troops reconvene outside a village, where they are taken to safety by a young woman named Chloe (Mathilde Ollivier). They run afoul of the local Nazi-in-command Wafner (Pilou Asbaek) and start to learn that there might be something funky going on in the local German base that they’ve been assigned to take down — you know, other than a genocidal regime. Some investigation reveals that the Germans have developed a serum that reanimates corpses and grants them super strength and speed so powerful that it seems to rip apart their own bodies as they fling themselves at their targets. It’s a gruesome bit of invention made considerably less horrifying than it sounds if only because you can nearly make out the ones and zeros weaving together the film’s mangled undead. Also, they are superzombies, which are fake, compared to the very real National Socialist Party. Despite the heavy context and historical precedent, there’s not a whole lot on Overlord’s mind, and a gestured-at “defeating the monsters makes us monstrous” philosophical thread ends symmetrically but pointlessly. Even as a gross-out wartime yarn, the film feels strangely antiseptic. As I watched it, drifting in and out of that uncanny third-person-shooter valley, a weird paradox occurred to me. Contrary to the qualities we tend to think of when we think of video games — immersive, real-time, involving — I found myself more outside the action than even more technically and narratively inept films, even on a five-story-high IMAX screen. I was aware of the layering of the audio, the digital washes of color juicing up an otherwise dimensionless scene. I started to wonder if I could identify the beginning and end of environmental noise loops. And, perhaps most importantly, I was all too aware that I was watching a wide-release, special-effects-heavy, original, stand-alone piece of rated-R entertainment. Where do those exist anymore, outside of a console?